Powerful, versatile, high value for money! Dimensions DxWxH 11.5" x 6.0" x 5.5"
My neighbour was looking for a small-form amplifier for the in-wall speakers in his kitchen. Since the speakers were probably somewhat inefficient, we tried a couple of low-powered digital amps but they were not able to produce enough SPL. Most conventional class A/B integrateds were either too large or too expensive, and so were also ruled out of the running. And then I found this little beast, sold by Dayton Audio which is headquartered about 50 miles away from my house. The amps came with a money back warranty and were about $120 each, so my neighbour had no risk in trying them out...and he was very happy with the result, and I had a new candidate for review. I can't say the folks at Dayton Audio are very well geared to marketing and PR. It needed several attempts to get a hold of someone or to have a phone call returned...it sometimes amazes me how poor some companies can be at availing themselves of free publicity. But, finally when I did get connected with the correct person, things moved very quickly and I had a review sample in my hands within a few days. 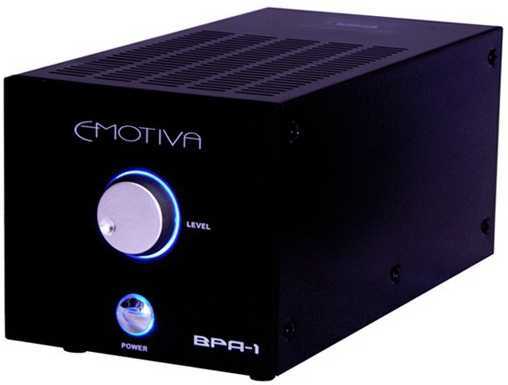 The profile of the amp is minimal and svelte, with a square face of only about 6". The brushed metal faceplate features nothing more than a power button and it's attendant blue LED, as well as a volume knob of very smooth operation. Overall, the aesthetics were a very clean and simple affair - rather elegant, belying the astonishingly low price point of this amp. The rear panel features a 3-pin IEC input, switchable between 120V and 230V. Also on the rear were the pair of 5-way speaker outputs, 1 set of line level input and 1 set of line level output, obviously no input switching is available here and there is no remote control either - you really can live without those. They are not needed in some applications, and not necessary in any - maybe just convenient. The rear panel also has the vent slots for the powered fan which seems to never be needed; and then there is also the auto-on switch, mono switch and low pass controls. Features and versatility wise, this is a very well thought out amp, and delivers huge value for the money in this aspect alone. I spoke with Mike Van Den Brok at Dayton Audio, who was the project manager on the design team for this amp. The unit was designed and put into production in 2008. Their stated goal was to develop an amp that could be used in a variety of situations, those being - a regular stereo integrated amp, a subwoofer amp and home theater amp. The amp features a defeatable low pass filter, that is variable from 50-150Hz and has a 18dB/octave slope. When in "Flat" mode the amp runs full bandwidth, and in the "Lowpass" setting it can be used as a subwoofer amp with the crossover point variable between 50 and 150Hz. From what Mike tells me of the stress tests they performed on this model, the results are quite impressive - especially given the very low price point. Mike reported that his tests measured the amp's output at 75wpc @ 4ohms in stereo mode, 0.01% THD, full bandwidth; and 50wpc @ 8ohms. He recalls that it was also tested to work in 2ohms, but if used over an hour it will overheat and shut off. He says it took 15-20 mins to trigger the fan at a 1ohm load. He also remembers testing it down to 1hz, but bandwidth spec with tolerance was not available. The APA150 can also be used as a mono block; where by it is rated at 150watts @ 8ohms, not tested at other impedances but Mike guessed it would yield 200-250 watts in 4ohms. All in all that is pretty impressive specs, especially given the street price. 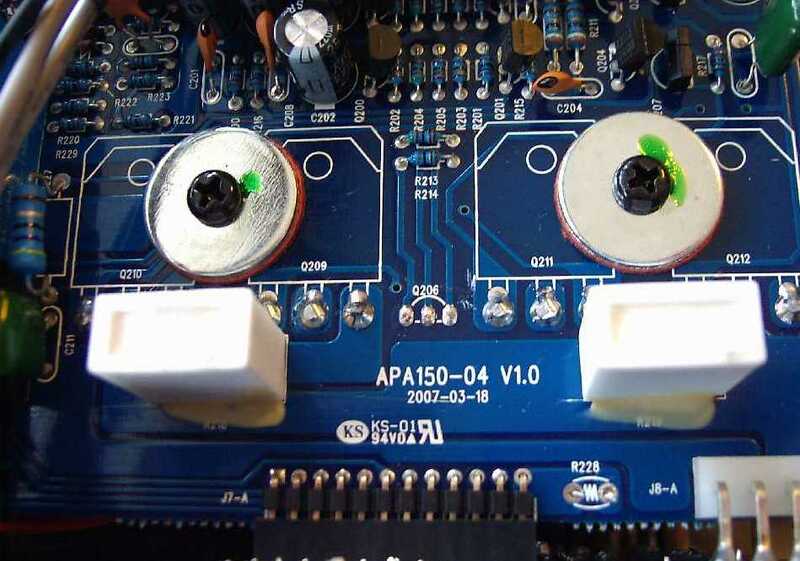 This APA-150 uses a rather conventional configuration and internal structure: Class AB operation with 2 transistors per channel, installed on a closed heatsink, connected to a cooling fan that activates when internal temperature of the heatsink is too high. This happens after a couple of hours at maximum power output. It is extremely silent (i.e. hard to detect by ear) and normally switched off during standard listening. With a switch in the rear this amp can be put in mono mode to deliver something like 150 watt on a 8 Ohm load. 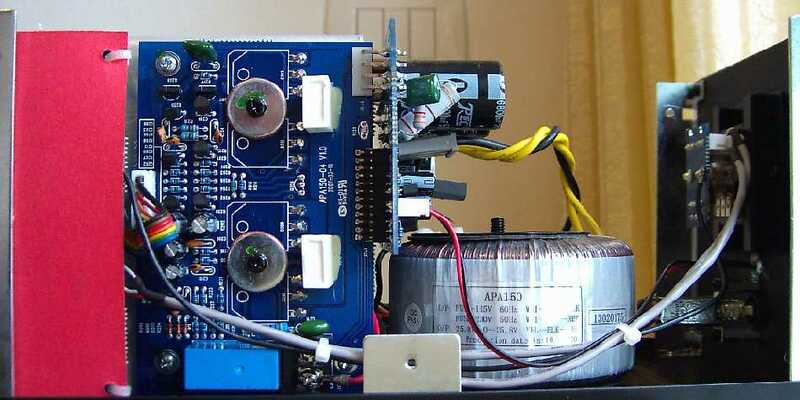 The amp makes use of a 750 watt toroidal transformer, with 25.8 volt outputs. The power supply section is completed by 2 electrolytic 6800 uF / 50 volts caps supplied by Transcend Electrolytic Co. (TEC) (Taiwan). It was impossible to read the type of bipolar devices without completely dismantling the unit. General layout is quite chaotic, with wires running from everywhere. The printed circuit boards report the following: APA150 -04 ver. 1.0 (2007). They seem to be produced by the Chinese brand KS. The owner's manual can be downloaded directly from the Dayton Audio official website. That said, with just few cents of rubbing compound they should - at least - erase the Dayton logo from the front panel (see pic, the logo is still there...). My suspect is that the APA-150 is a 100% Chinese amplifier, sold under different brands (Dayton, Emotiva and Linn Audio of New Hampshire). The Dayton APA-150 can be bought directly online from www.partsexpress.com (if the link doesn't work, go the the Partexpress home page and search for the amp), Amazon.com and other websites. Otherwise, the Dayton website publishes a list international distributors. European customers might find Intertechnik.de, in Germany, the best place where to purchase this amp, at the moment its price is 168 € + VAT. This way there will not be customs fees to pay, just shipping. So specs and measurements are fine, but resolution and performance in the listening room is what really matters. I often wonder, if a good beefy amp is really all that one needs, or if there truly is a noticable and significant difference that an amp of similar output but "refined" design and components delivers? There, of course, is only one way to find out for sure - and there in come the listening tests. For the listening tests I used a Quad ESL 988, mostly in nearfield configuration, and for direct comparisons I used the previously tested and similarly modestly powered TBI Millenia that retails for USD $500. I use a segment from this track to test for low frequency performance on the electric bass. I had a hell of a time telling a difference between the 2 amps. With a low level of confidence I would report that the Dayton seemed to have a slight bit more grunt in terms of bass extension, and the TBI maybe had a touch more finesse and clarity. This test also is used to test low frequency performance, but this time with a double bass. With a bit more certainty that the previous test, I can report that the Dayton Audio had a bit more extension in the bottom end. I use this track to test for naturalness of male voices, hall ambience and overall resolution. The TBI had a definite edge here. Most of all there was more depth and dimension to the venue, noticeable not just in the layering of voices from various distances from the mics, but also in the micro spatial cues surrounding them. Also quite noticeable was the reproduction of the Mohan Veena, with significantly better transient response and naturalness in terms of bloom from the plucked strings. This spectacularly recorded demo is one of my favourite tests for acoustic guitar. Again, the TBI had a slight advantage on the transients and dynamics of stringed instruments - a plucked acoustic guitar in this case. This track is used to test for naturalness and detail of female vocals. Upon micro inspection, I'd say with some confidence that the TBI rendered a bit more micro-detail. This was noticed in the wavering of notes and inflection, the Dayton by a minute margin was slightly flat sounding, as in lacking the ability to produce as much detail and nuance. Sonically, I'd say the Dayton Audio amp redeemed itself very nicely here. Keep in mind it was being compared to a much pricier unit, that I previously reported as an outstanding performer. And also the tests were done using as revealing a set of speakers one would expect to find. As perhaps one would expect, it was not as refined as the much pricier TBI Millenia, but those difference were fairly small in relative magnitude. And the Dayton Audio unit did provide a bit more output in the lowest frequencies. 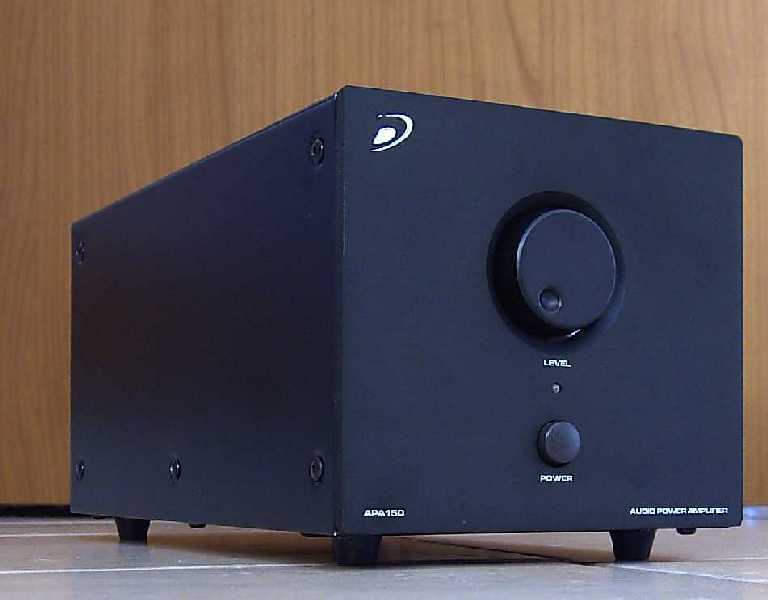 In February 2011 we reviewed the Dayton Audio DTA-100 Class D integrated amplifier, a small 25 watt x 2 gem, equipped with the Tripath TK2050 chipset, that sounded incredibly well for just 100$. Likewise the APA150 even the DTA-100 featured just one single line level input, though this was somehow duplicated in the front panel. It also offered a quite useful headphones jack. Power output is half that of the APA150 but its size (and weight!) is several times less :-). Moreover, heat dissipation isn't a main concern, since the Class D operation mode makes the amp run extremely cool. 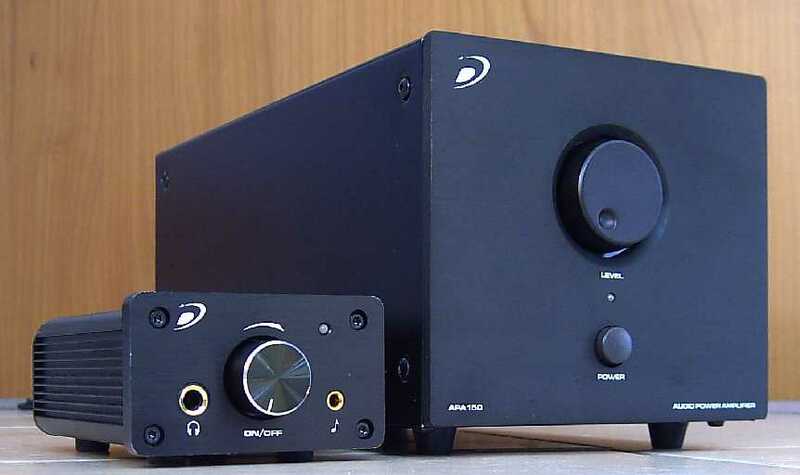 All in all, these are two very different amplifiers, with different targets in mind and different features. And one APA150 costs like two DTA-100's (regular list prices). My opinion is that if you don't need the extra versatility and power output of the APA150, then the DTA-100A is a better choice. Smaller, cooler, less expensive and still powerful enough to drive even low sensitivity loudspeakers. Plus, it possesses that magic touch in the mid-high range Tripath-based amps are famous for. Of course, at just 128$, the special offer price now available at PartExpress, the APA150 becomes an easy winner. At 210$, its regular list price, the DTA-100 seems to have an edge over it, at least in terms of quality/price ratio. Though a bit inexpensive looking, the amp is rather well made. The front panel is unusually thick (6 mm) and nicely finished for the price tag. The rubber feet are just basic stuff while the output/output posts are of good quality. The speakers binding posts are a bit too close one to the other. The cooling fan is very silent and doesn't activate unless you're really forcing the amp beyond its limits. The unusual shape of the chassis, which reminds me the famous Carver Cube (M400), might be troublesome to place on narrow HiFi racks. All the switches are placed in the rear panel, certainly not an easy to reach position. 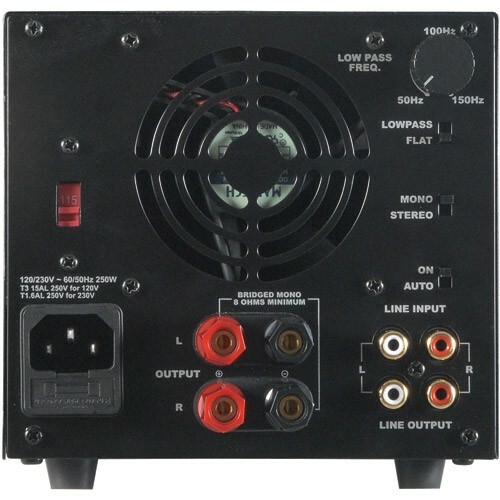 It is true that some of these might be used just once but the adjustable subwoofer frequency pot would have been easier to operate if located in the front panel. Volume control, being quite recessed, isn't exactly comfortable to operate. The potentiometer seems quite precise and shows a good channel balance (a problem which has been reported quite often by DTA100 owners instead). Finally, do not forget this is, actually, a power amp. This means that certain sources might be inadequate to drive the unit appropriately and you might need an active preamp. In other words, depending on the source, even with the volume knob completely turned clockwise, you might not be able to exploit the full power output of the unit. For example, it was impossible to reach clipping when using an old Cyrus PCMII CD player as source. This is because input sensitivity is low. If that's your situation, and you feel you need all the power the APA-150 can deliver, plan to add an active preamp. At its regular list price (± 200$) you can find many competitors, with similar power output and a lot of extra features: several line inputs, phono input, remote and tone controls etc.(e.g. Denon PMA510AE). If you don't need the extra (and rare) features of the APA 150 (subwoofer filter, mono bridgeability, compact size etc.) take into proper account standard integrated amps from popular Japanese brands as well. Perhaps not the ultimate amp in terms of precision, transparency and imaging this APA150 is very hard to criticize. Especially with this price tag and considering the versatility it offers. Not sure if it is the worldwide economic slump or happenstance that caused it to happen, but if for $128USD this is what can be bought - it is good news indeed for the hobbyist, either that or the Cost Accountant at Dayton Audio made a huge mistake. My recommendation to anyone starting out or otherwise needing a modestly powered integrated amplifier, this is a great place to start. You will have to spend a lot more money to get a significant upgrade in sound quality. And given the versatility of this amp, I am simply amazed at what they have packed and designed into this amp.